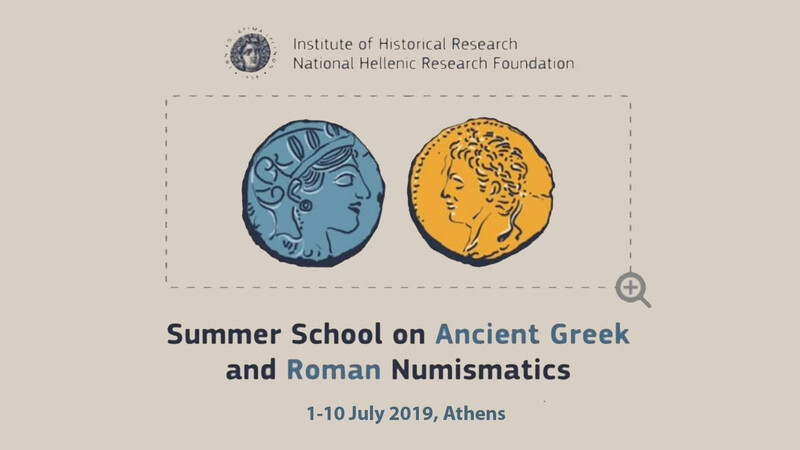 The Institute of Historical Research of the National Hellenic Research Foundation, one of the most important establishments for the research and study of the Greek history (ancient, medieval and modern) at international level, is pleased to announce the organisation of its third Summer School on Ancient Greek and Roman Numismatics, to take place at its premises in Athens, from 1 to 10 July 2019. The ten-day intensive Summer School aims at familiarising those who have little or no background with the discipline of numismatics by offering a series of introductory courses in numismatics, visits to major numismatic collections in Athens, as well as guided visits to archaeological sites in Attica. The courses provide a chronological survey of ancient Greek and Roman coinage (from the pre-monetary period down to Roman times), combined with lectures on numismatic methodology and other more specialised topics. For 2019 there will be an emphasis on the information coinage can provide on ancient cults, on evidence concerning coinage in a ritual context, combined with guided visits to important sanctuaries in Attica. The lecturers are mainly researchers at the Institute of Historical Research of the National Hellenic Research Foundation, with contributions by other experts in Greek and Roman numismatics. Each year a distinguished visiting scholar is invited to develop a special topic. For 2019 the visiting scholar is Andrew Meadows, Professor of Ancient History at the University of Oxford. The number of participants is limited. They will be selected by a Scientific Committee following a thorough assessment of the application and the CV of the candidates.